I’ve been pretty busy the past few weeks and not great with updates: The Washoe fire ended up coming much too close for comfort, so we evacuated up to Incline Village. However, between smoke inhalation and anxiety, I ended up in the ER and was pretty sick for about a week. Since then, I’ve had a couple of projects going on with the house (I could not live with the brown bathroom any longer), am trying to get back into Bikram yoga and have spent an inordinate amount of time reading and rereading Elmo’s Animal Alphabet to Nora. I did not expect my reading material to change so much with parenthood! 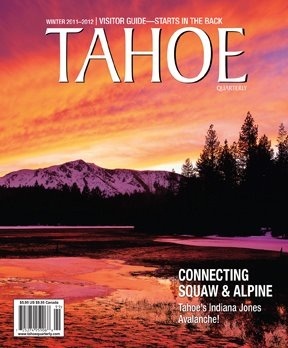 Anyway, I finally got my copy of the Winter 2011-12 Tahoe Quarterly! This is the first issue that I haven’t worked on and it was surprising pleasurable to enjoy the articles as a reader and not as an editor (although, who am I kidding, I can’t read a cereal box with a little mental editing!). I wrote a Valley View piece about the children’s Discovery Museum that opened in downtown Reno (and Nora’s got a cameo appearance in the story) and a Well-Being piece about the new Cancer Center that is opening in Truckee in the coming months. There are some interesting reads, including a piece about the Squaw Valley/Alpine Meadows merger, one about the High Fives Foundation and another about the Woodward camp opening at Boreal (which I used to attend in Pennsylvania for gymnastics). And of course, always gorgeous photography, so grab a copy if you get the chance. This entry was posted in Published Work. Bookmark the permalink. Hello! I’m Alison Bender, a freelance writer and editor based at the foot of Mt. Rose, between Reno and Lake Tahoe. I write about a variety of topics, including architecture and design, local history, art and outdoor activities. Feel free to browse through a sampling of my published works, or contact me at alisonobender@gmail.com.